Victorian wax baby heads peeking from a basket. Peeking from a basket are two wax baby heads with blue glass eyes and highly-characterized expressions,blonde mohair wigs. Also peeking out are a hand and feet. The basket is trimmed with net and silk ribbon trim. Comments: for the French market,late 19th century,the item like this were presented to gifts at Christening events. Size H. 5 1/2" x 4 3/4" / 14 cm x 12 cm. All original! From the Legoland museum comes this outstanding and charming Slithead doll with a great personality! She is made of Wax over papermache ca 1830.She is in an unique condition. A large charming rare girl with blue inset eyes, original long curly wig set in a slit in her head, and a very lovely smile. She is in very good condition. She is dressed in her lovely all antique hand sewn cotton gown and with layers of lovely underwear. She wears a little bonnet and blue leather boots.. She is 65 cm tall./ 25" tall This remarkeble lady is all original and with an interesting provenance from Estrid Faurholdt. A very pretty slithead from the famous collection of early dolls at Legoland in Denmark.A wonderful memory of the late Estrid Fauerholds dolls. Estrid Faurholdt wrote the book Dolls and Dollhouses together with the late Flora Gill Jacobs. Lucy Peck poured wax doll. Wax doll, poured wax, made by Lucy Peck, England. Made arround 1870.She is in a very good condition. She comes from a museum, that closed years ago in has since been in my own collection. No repairs.Inset glasseyes. A very pretty molded face. Nice shaped limps. White dress and hat trimmed with lace.Underwear and shoes. All original. She is 46 cm tall./18,5 inches. This lovely early girl doll is made of Wax-over Papier-mache This lovely little lady has her marvelous original mohair wig in a lovely childish style with blue silk band.She has large blue inset glass eyes,a lovely mouth and such a sweet expression.Her cloth body with wax limbs in wonderful condition and she is wearing her original amazing red silk dress, beautifully trimmed with lace.All original and in extremely good condition.She has her cream-painted boots with black and red striping! She is English origion, but has been in a Swedish manor house for a decade.Her history is so interesting. Circa 1860.This lovely girl comes with the provenance, sewn on the inside of her dress. From a Swedish estate.Size 30 cm/ 12". Lovely vitrine size. 14"Unique baby doll, crying, ca 1840 from The LEGOLAND Museum. 14"Unique baby doll,-a wonderful and Rare museum item-a crying baby doll, 1850 from The LEGOLAND Museum. 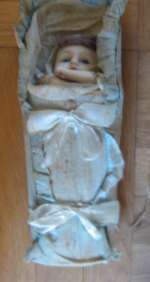 This wonderful conserved wax baby is now more than 150 years old and still neraly untouched. Never played with. The lovely baby of poured wax is swept in blue silk, tulle and cotton, with lots of lace. The baby itself has a shirt with lace and a bonnet. Human hair wig. The baby is also an automate-crying, when you pull the string at the lower right side. Never been out of the beautifulnewborns swept clothes. A lovely memory of the great early treasures from the Legoland collection. Size 14" 36 cm. 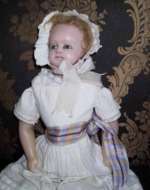 A really beautyful wax doll from England. 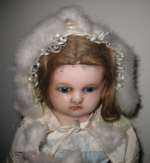 Made ca 1860.She is in a very good condition. She comes from a museum, that closed years ago in has since been in my own collection. 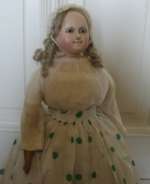 Large waxdoll in wonderful all original condition. She has inset lovely blue large eyes,lovely facial features, original human hair wig, waxed lower limps, clothes original ( a lovely fur trimmrd satin jacket trimmed with fur and matching hat and a blue gown are so lovely on her and all autentic and antique-,body made of cotton filled with sawdust. If you never had a wax doll before, she would be lovely and she is in wonderful shape!!. Her dress is made of cotton, her coat and hat are white satin trimmed with fur. Everything is original and very pretty. A rare early waxdoll. Size 24 inches. Very good condition! Wax doll, poured wax, made by Monatnari. Made about 1850.She is in very good condition.England. Made arround 1880.She is in a very good condition. She comes from a museum, that closed years ago in has since been in my own collection. No repairs. Wonderful face typical to the firm. Nice shaped limps. Each hair separetly inset in the wax. No repairs to the wax either face or limps.Rosa dress and hat trimmed with lace. All original. She is 46 cm tall./18,5 inches.